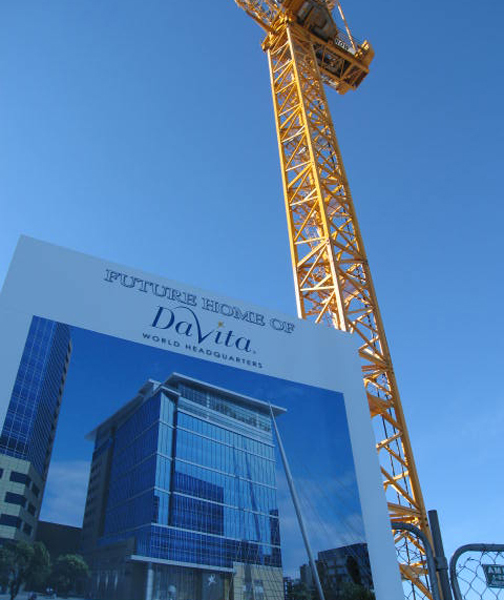 Last week a huge crane was put in place for the construction of the DaVita building. Located on the East side of the Millennium Bridge, it will be fascinating to watch this new building join the skyline. It wasn’t very long ago that DaVita announced their plans to move their headquarters to Denver and now the new building is becoming a reality. It’s exciting to think that one of the main reasons DaVita chose this location was because of the incredible amount of transportation going in with the Union Station Redevelopment. They are the first of hopefully several Fortune 500 companies to relocate their companies to Denver.